There it is – did you read it? You probably saw it, but did you really read what it says? Me neither. At least not after years and years of seeing it, or a similar message at the beginning of every movie I’ve ever watched. So what does this mean exactly? In short, it means that if you own something like a DVD of a movie, or a CD, you can’t legally burn copies of that disc and sell them to people, or even hand them out for free. Nor are you allowed to show that movie or play that album for the general public without the expressed consent to do so. If you’re looking for a something you can play instead, take a look at It’s Relevant TV. You might be wondering where the line is drawn, and it’s a fair question. Just like when you get a driver’s license that allows you to drive a car, when you buy anything like a DVD you’re buying the license to watch or listen to that media privately. Now before you go taking a hammer to your home theater, it’s important to note that while those licenses are private, it doesn’t exclude friends and family from enjoying them as well – the means to actually traffic and enforce that would simply be ridiculous. So long as your viewing is limited to personal and non-commercial use, you’re not in violation of the Terms & Conditions. Is it Legal for Me to Show Netflix in My Business? This is a prime example of how companies lay out licensing agreements. Does this mean you can’t show Finding Nemo in your waiting room? Unfortunately, you can’t. The difference between throwing the movie into your DVD player at home, and the TV at your office – is that one is at home (personal), and the other is a business (public). It’s the same reason you can’t buy a Taylor Swift CD and play her songs outside your store to attract customers. You can try, but it’s illegal, and it’s not good when you get caught. Companies take this sort of thing very seriously. But Were DVDs or Netflix a Good Idea in the First Place? When your visitors are at your location do they really want to watch a movie? Not really. They’re there for a reason and don’t want to be around long. People want to watch the TV as a distraction while they wait, but can’t be invested in a long-form program or movie. The average time spent in a waiting room varies from business to business. Dentist offices come in at 5 to 10 minutes, whereas you could be waiting up to 20 minutes at a doctor’s office. Even if you could play the movies you wanted, a typical feature-length flick usually runs over or just under two hours. So unless you’re waiting over an hour for your car to be serviced, you’d only catch 1/12th or 1/6th of the movie – starting from who-knows-where. The sort of programming that runs in a lobby should compliment the length of time people are going to be waiting there, with the notion that they’re not going to be fully invested in whatever’s on the screen. So What Can You Play Instead? 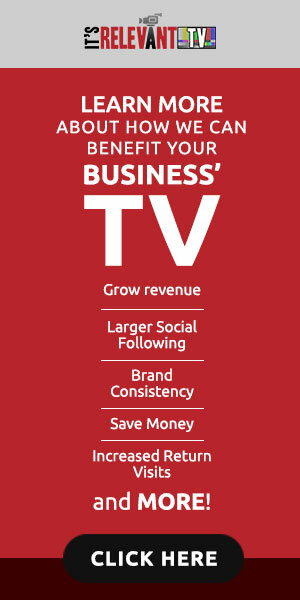 It’s Relevant TV features a network of original content spanning across a vast selection of categories. And unlike a DVD or Netflix, all of the content is licensed for public display. From kid’s entertainment to the national news, the programs are on average two and a half minutes long – long enough to hold someone’s attention in a waiting room and feel as though they left entertained or informed.